Since it’s Bees Needs week, I thought that I would put together a blog about bees using photographs I have taken recently in Scarborough and Spain. Taking photographs of bees is fun, but it is a bit of a hit and miss process and you need to take quite a lot of shots to get some good ones. Well at least I do! One thing that strikes one when looking at photographs of bees feeding (nectaring) on flowers, is their tongue, or proboscis. 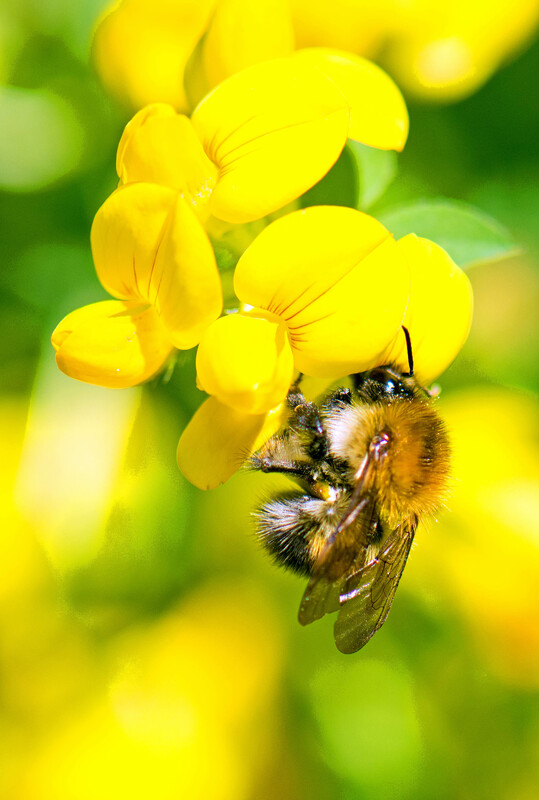 In the following photo, a common carder bee does not look like it is having any problem obtaining nectar from a Birds-foot-trefoil flower, but it might be challenged by flowers with long corollas (the tube leading down to the nectar). The bumblebee tongue or proboscis is a complex organ which consists of a tongue proper – with a hairy or feathery end adapted for absorbing nectar – sheathed in a pair of palps and the maxilla (1). For a fantastic close-up photograph of a bumblebee tongue, click on the link below (link number 2) to the site of macro photographer, Adrian Thysse. 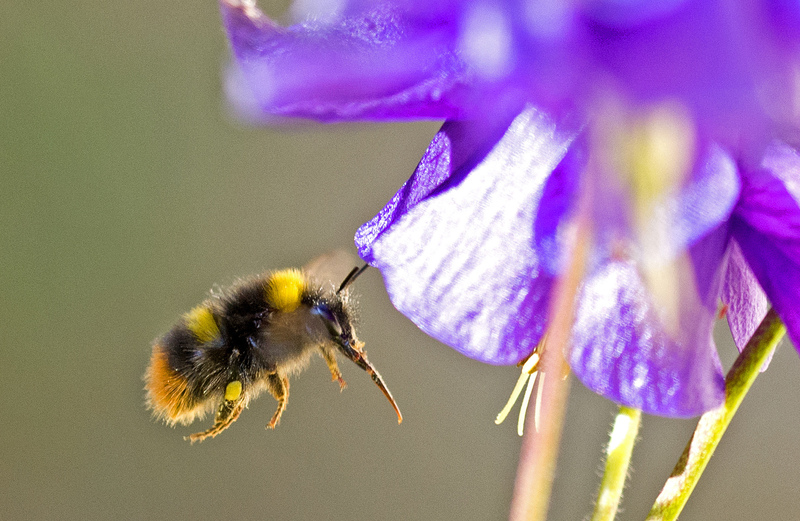 The Early bumblebee, in the following photograph, has a relatively short tongue compared to some other species, but it still looks quite long in this image. The hard, shiny maxilla which sheathes the tongue can be seen in the following photograph of a Garden bumblebee, Bombus hortorum. The tongue can be well over one centimeter long in this species (see below). Bombus hortorum proboscis or tongue. Galicia, Spain. 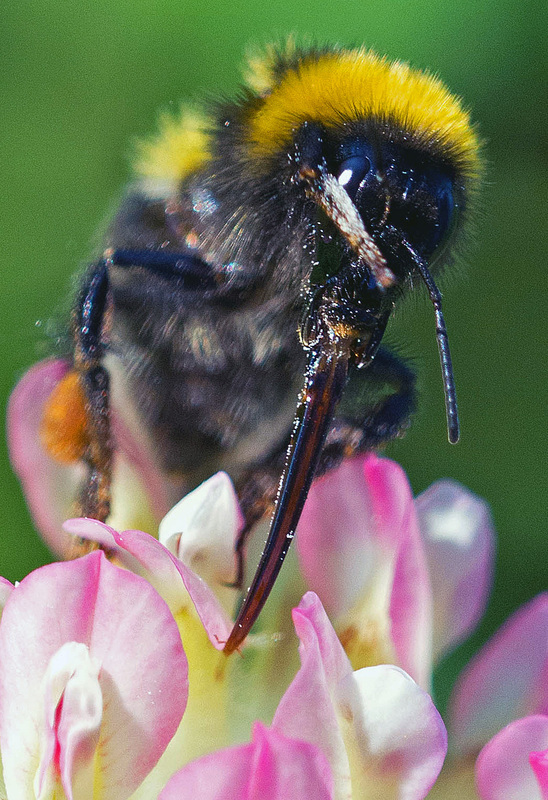 Bumblebees with long tongues are in general able to access nectar from a greater variety of flowers than those with short tongues, and as a consequence they feed on a larger number of species (3), assuming that they are available in a given habitat. 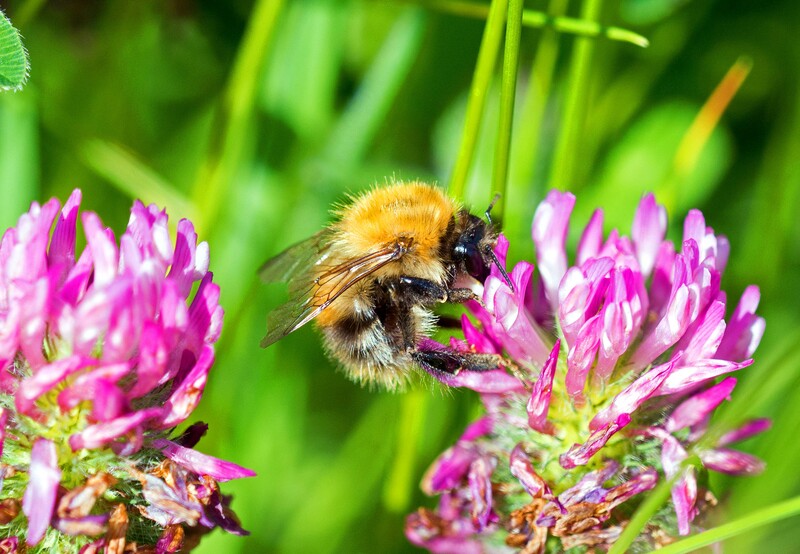 The long-tongued bumblebees have also been found to forage significantly faster than bees of shorter proboscis length on flowers with long corolla tubes (4). Bumblebees with shorter tongues, not surprisingly perhaps, preferred to forage on flowers with short corolla tubes and were more efficient at getting nectar from them. Relative tongue lengths of worker bumblebees are shown in the following table taken from the www.bumblebee.org site (1), although it is worth remembering that the glossa is a flexible and somewhat elastic organ. The data come from Brian (1957) I think (5). 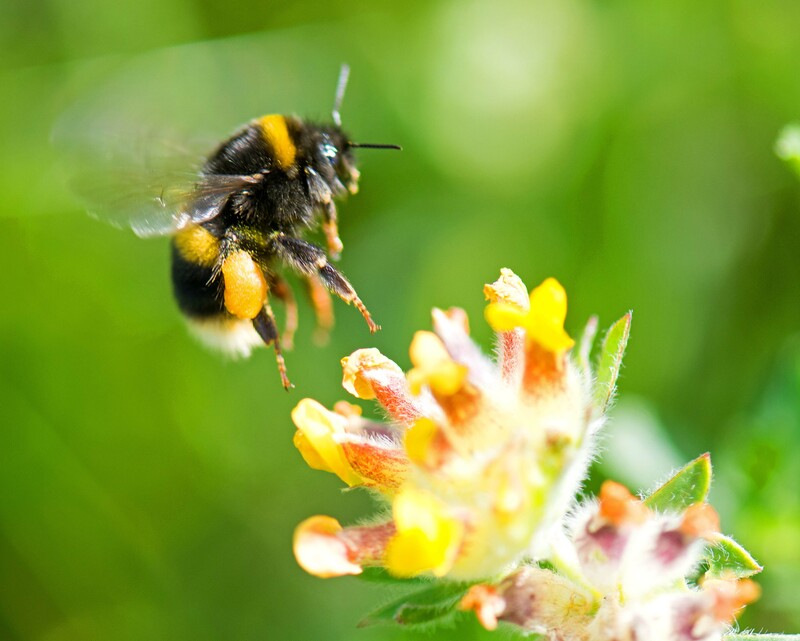 As well as having different tongue lengths and visiting a different range of flowers, bumblebees of different species have been found to collect a different range of pollen (6). The pollen is carried in a pollen sac, or pollen basket, which is just a flat area on the leg surrounded by a cage of spiky hairs. I am always impressed how bumblebees are seemingly able to multitask: feeding on nectar at the front end; walking with their forelegs; and scraping/combing pollen towards the basket on the rear legs, with their middle legs! The sacs of pollen look so large sometimes, the aerodynamics of the bee must change depending on whether the pollen basket is full or empty! Another White-tailed bumblebee (below) has an empty pollen sac, and it is possible to see the fringe of hairs on the hind leg, which form the basket. 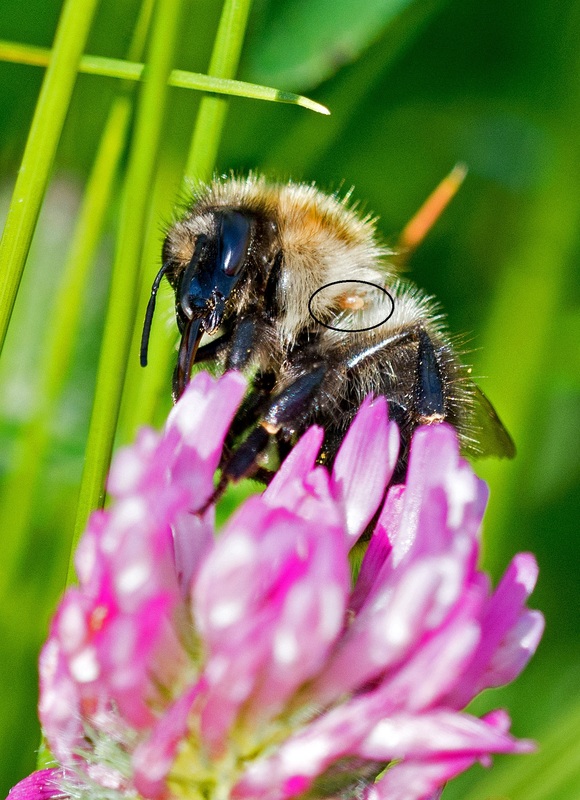 Another feature which sometimes becomes apparent when taking photographs of bumblebees, is the presence of tiny mites clinging on to their bodies. 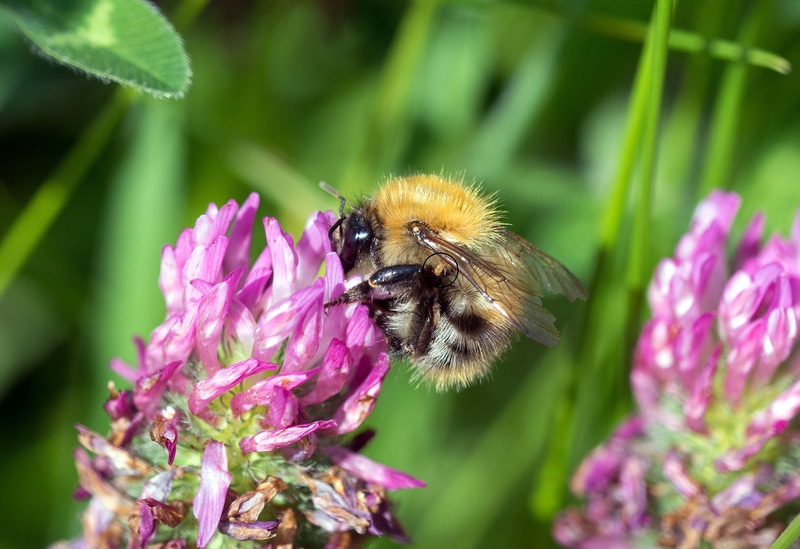 One can be seen, just under the wing, in the following photograph of a Common carder bumblebee. These are generally assumed to be fairly harmless, in that although they live in bumblebee nests, they only feed on the detritus, wax, pollen and rubbish discarded by the bees! They use the bees as a form of transport and can get on and off as they please; a bit like getting off one bus and boarding another; the bus stop in this case, being a flower! If they cling on until the bumblebee returns to its nest, they can move home in this way. The technical term for this behaviour is called phoresis, so they are phoretic mites. They are also called commensals, which means that they are involved in a symbiotic relationship in which one species (the mites) is benefited while the other is unaffected (the bees). There are of course damaging, parasitic mites, like the Varroa mite, but that is another story. The numbers of phoretic mites per bee can vary enormously and in one study ranged from one individual to over 100 per bumblebee (8); 200 per bee in another (9). Why some bees have so many, and what it means for them in terms of their health and fitness is something that is being studied, and my guess is that there is more to this relationship between bees and mites than we may realise. Harder, L. D. (1985). 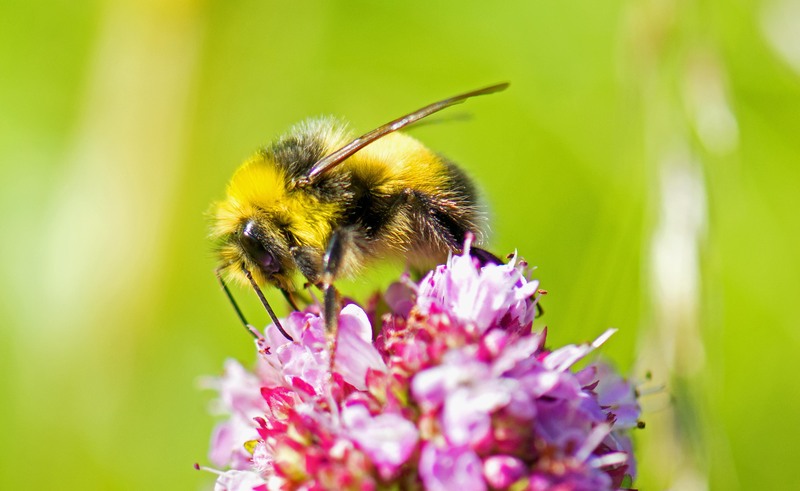 Morphology as a predictor of flower choice by bumble bees. Ecology, 66(1), 198-210. Inouye, D. W. (1980). The effect of proboscis and corolla tube lengths on patterns and rates of flower visitation by bumblebees. Oecologia, 45(2), 197-201. Brian, A. D. (1957). 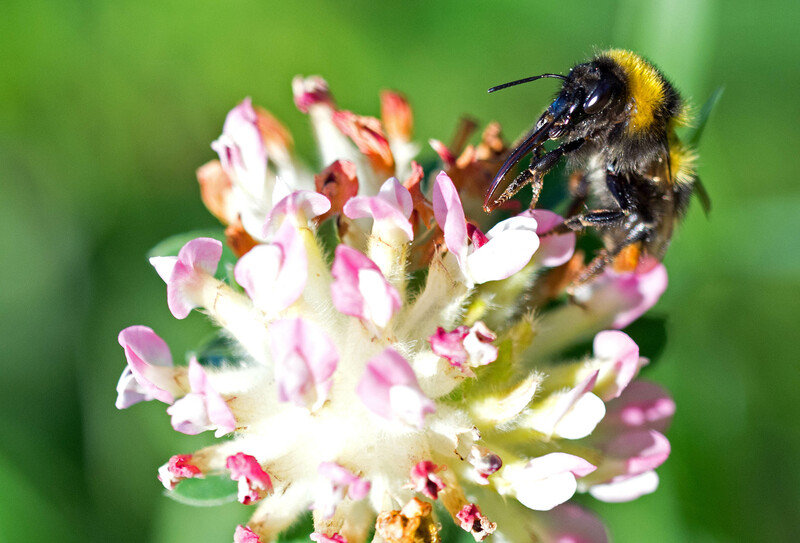 Differences in the flowers visited by four species of bumble-bees and their causes. The Journal of Animal Ecology, 71-98. Brian, A. D. (1951). The pollen collected by bumble-bees. The Journal of Animal Ecology, 191-194. Chmielewski, W., & Baker, R. A. (2008). Mites (Acarina) phoretic on some common bumblebee species (Bombus spp.) from the Pulawy area (South-Eastern Poland). Journal of Apicultural Science, 52(1). Next Next post: Such good parents! Ray Cannon's nature notes Bees knees and tongues!